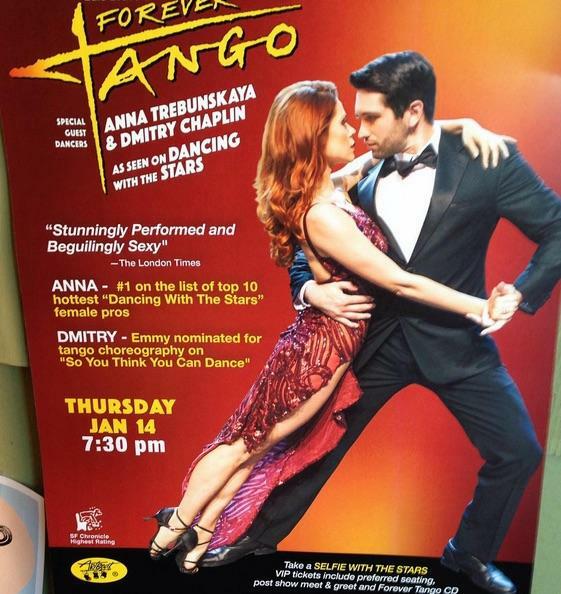 COME TANGO WITH THE STARS featuring ANNA TREBUNSKAYA and DMITRY CHAPLIN as seen on DANCING WITH THE STARS performing with LUIS BRAVO’S internationally acclaimed FOREVER TANGO!! FOREVER TANGO celebrates the passionate music and dance of Argentina, with Six world-class Argentine Tango couples (plus Anna and Dmitry as seen on Dancing with the Stars), a traditional Argentine 1930s style vocalist and eleven piece orchestra featuring the instrument of the tango, the bandoneón, a 19thcentury German accordion. The dances, performed to original and traditional music, are the result of collaboration between each couple and director/creator, Luis Bravo. FOREVER TANGO opened on Broadway in June of 1997 for what was expected to be an eight-week engagement but ran for 14 months! Its 92-week run in San Francisco set a record for that city's longest run of a touring show. Since 1990, Forever Tango has been seen by over 7 million people in South and North America, Europe, Asia and Australia.